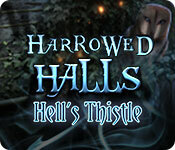 The Harrowed Halls games are developed by Daily Magic Productions. These are Hidden Object Puzzle Adventure games (HOPAs). While these games fall into the ‘casual’ genre, the first game in the series, Harrowed Halls: Lakeview Lane, is an intense game and is intended for mature audiences. The second game in the series is less intense, but still a psychological thriller.